The DwgCompare command compares a selected drawing with the current drawing during a comparison session. The EndCompare command concludes a comparison session. The KeepMe command allows to merge the compared drawings visually. 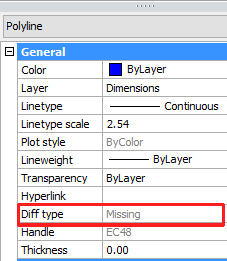 Sets the color for displaying entities which are missing in the other drawing. The default color is Red . Sets the color for displaying modified entities in the current drawing. The default color is index color 253. Sets the color for displaying modified entities in the other drawing. The default color is Yellow. Sets the color for displaying entities which are new in the other drawing. The default color is Green. Sets the limit for entities comparison. The comparison will be aborted after reaching the difference limit. Values between 1 and 10 000 000 are accepted. (option) Choose the Limit option to set a new value for entities comparison. Press Enter to display File dialog box. 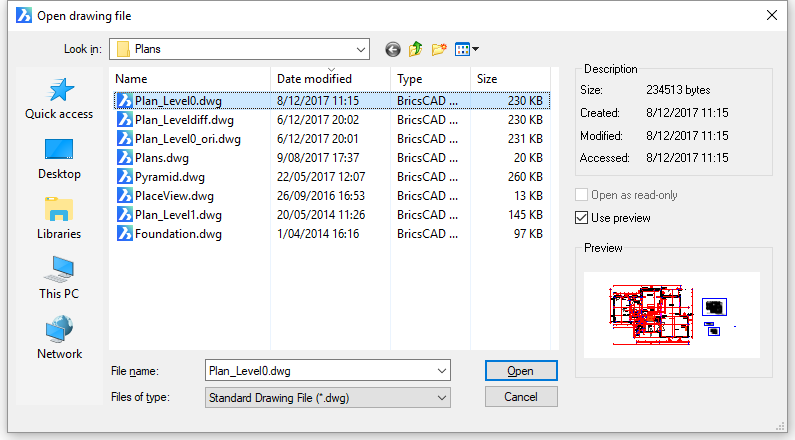 Select the drawing to be compared with the current drawing, then click the Open button or double click the drawing name. The differences between the two drawings display using the Compare Display Colors. Select the entity and check the Diff type field in the Properties panel. 6. Analyze the comparison in the Structure panel. 7. Merge the compared drawings. 8. Click the Endcompare tool button ( ) on the Compare toolbar to conclude the comparison session. Load the Default.cst configuration. See Load a Structure configuration file. Four subnodes display: Missing, Modified (Original), New and Modified (Compared). The number of entities in each subnode is indicated between brackets. Click a subnode to select the corresponding entities in the drawing (see also the note below). Expand a subnode, then click an entity to highlight the corresponding entity in the drawing. Press and hold the Ctrl-key to select multiple entities. Right click, then choose Zoom in the context menu to zoom onto the selected entity or entities. When selecting entities in the Structure panel, entities are either selected or highlighted in the drawing, or tree selection is ignored. See setting the options in the Structure panel. Select the entities you want to keep, then click the Keep Me tool button ( ) on the Compare toolbar. Select the entities you don't want to keep, then click the Delete tool button ( ). In the Modified (Original) node: select the entities you want to keep, then click the Keep Me tool button ( ) on the Compare toolbar. The corresponding entities in the Modified (Compared) node are removed. In the Modified (Compared) node: select the entities you want to keep, then click the Keep Me tool button ( ) on the Compare toolbar. The corresponding entities in the Modified (Original) node are removed. The merge is complete when the Comparison node in the Structure panel disappears.